Loss of quality sleep is one of the most difficult aspects of perimenopause and menopause to navigate. Sleep problems due to night sweats and hot flashes affect overall quality of life, and may cause all kinds of physical, mental and emotional health issues like fatigue, inability to concentrate, irritability, anxiety, and depression. 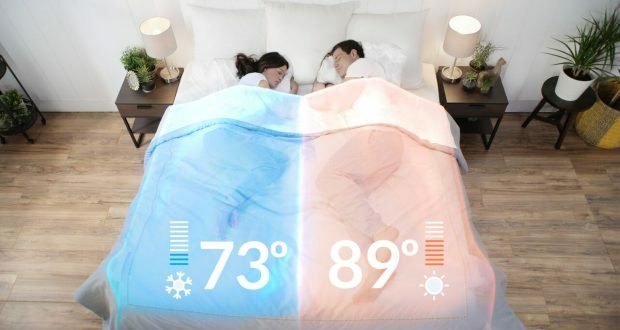 Plus, the need for a very cool sleep temperature can cause major relationship problems – sometimes partners can be literally frozen out of the bedroom! But there’s good news. A groundbreaking product called BedJet! – A climate comfort system that installs on any size bed and can be pre-programmed with custom sleep temperatures for each hour of the night – can provide relief without the use of drugs or hormones. BedJet is Must Have Holiday Gift for Night Sweats/Hot Flashes! The BedJet (currently on Holiday Sale for $299) comes in different configurations for singles and couples. If it’s just you in bed, you can use the BedJet with your regular sheet or their Single Zone Cloud Sheet for the best cooling experience. If you sleep with a partner who doesn’t want to feel the cooling air, BedJet’s Dual Zone Cloud Sheet will allow you to cool your side of the bed without affecting the other side. Learn more about BedJet here. See How a Device Called BedJet is Helping Couples Fight Less, Rest More, and Enjoy Bedtime Again. *The study, titled The Efficacy of the BedJet Climate System® for Peri-Menopausal Night Sweat and Hot Flash Symptoms and Corresponding Impact on Sleep will be published as an abstract in the December issue of the scientific journal Menopause: The Journal of The North American Menopause Society. The results were recently presented at the North American Menopause Society Conference on October 4th, 2018.